How would you like to receive a monthly delivery of grass-fed, hormone-free, pasture-raised, non-GMO meats? If so, Grass Roots has you covered. 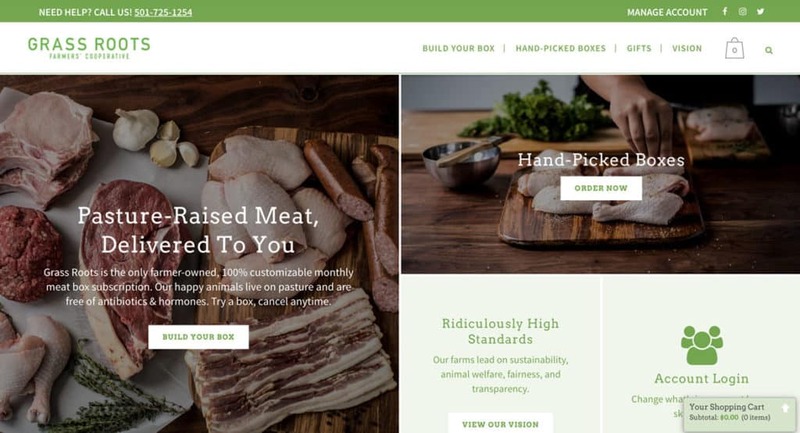 They are the only farmer-owned, 100% customizable, monthly meat subscription that you can currently sign up for. What makes them so special is how far they go to ensure their customers understand what they’re eating, where their meat comes from, and even how it’s raised. Grass Roots partners with farmers who are leaders in sustainability, animal welfare, fairness, and transparency. They work directly with these smaller farms so they can sell meat in larger quantities and pass better quality meats onto you. That means you can shop with confidence, as you’ll always know the most important details about the meats you’re getting. One of the great things about Grass Roots is that they give you the ability to fully customize your box. You don’t have to worry about getting any types or cuts of meat that you’d rather not have. You get to select exactly what you want every month, which then gets shipped straight to your home. You’ll begin with your first order by selecting the types of meat you want to receive. Add as much or as little to your box as you’d like. It’s totally up to you. Although, you might get a little carried away, like we did, when you realize just how much they have to offer! After you’ve added all of your favorite meats to your virtual shopping cart, you’ll be taken through the checkout process. Once you’ve submitted payment, you’ll automatically receive a confirmation email. Be sure to note that this is a subscription service so your order will automatically renew every month, however you’re never “locked in” so you can skip a shipment or cancel at any time. You’re in full control of how often you receive orders. And you’ll always have the ability to change what’s in next month’s box, so you can switch it up whenever you want. The ability to customize your box is a big plus and not one you usually see from “meat of the month” style subscription boxes. You’ll receive an email 10 days before your box renews, so this gives you plenty of time to switch out any items you might not want to receive again. If you ever need more meat, they also provide the option to switch to weekly deliveries if you’d prefer. So, you won’t have to worry about running out of your favorites and having to wait for your next delivery to arrive. However, if you’re feeling a little overwhelmed by all the options available, you can also choose to order a hand-picked box. These are a one-time purchase or can be done as a monthly subscription, which can be ideal for anyone who wants to try out the service first and get a full range of what they offer. Each one contains a selection of some of their best offerings, tailored to your specific interests or dietary preferences. It’s safe to say that Grass Roots has pretty much every kind of meat you could want to order. We were pretty blown away when we first glanced over their selection. Because they work with so many smaller farms, they have a massive variety of different types of meat, plus different cuts to help you whip up the meal of your dreams in no time at all. I definitely recommend checking out the full selection on their site. At this time, Grass Roots ships everywhere within the United States except for Alaska and Hawaii. If you’re within the contiguous United States, you are free to place any order. The date your order is shipped on will depend on your shipping zone, which has been outlined by Grass Roots on their website. For those in Arkansas, they ship out orders every Tuesday and Thursday. For those in other states, orders are only shipped on Tuesdays. Because it takes time for them to process and pack your order, you will want to take that into consideration when ordering from them. Once your order has shipped, you will receive tracking information that will allow you to track your box every step of the way. That means you can easily anticipate its arrival and possibly plan to be home when it gets delivered. However, if you can’t be home during delivery, the package will be left on your doorstep and should still be fine once you arrive home at the end of the day. You can expect either UPS or FedEx to handle delivery, as Grass Roots using both of them for shipping orders. Our first box was actually delayed because of a storm. However, we received an update email almost immediately letting us know that they are going to 2-day express service at no additional cost. This goes to show that, like their meats, their customer service is also top notch! To keep your meat frozen as it makes its way to your doorstep, Grass Roots uses special packaging. When you open up your box, you’ll find a green cell foam insulation lining. This insulation is corn-based and 100% biodegradable. Something both unique and pretty cool about the insulation they use is that it’s not only compostable, it also dissolves in water or it can be burned. Everything within your box will be packed with dry ice, which means some of it may still be in your box when it arrives to you. Definitely do not touch the dry ice and exercise caution when disposing of it as it can hurt your skin. All of your meat will be stored inside a cooler bag, which also helps to keep everything at the optimal temperature. You really shouldn’t have to worry about anything spoiling before it arrives, as they’ve taken great care to ensure your meat stays safe. Who Raised The Meat: The name of the farm and the size of the batch it came from. How It Was Raised: The number of square feet of pasture it has access to. What It Was Fed: Number of pounds of grain for chicken and pigs and grass for steer. Who Processed It: The name of the processor and the number processed on the same day. What It Cost To Raise The Animal: How much the farmer paid to keep this animal while it was on its farm. The Customer’s Price: How much you paid for this specific cut of meat. There is no doubt in my mind that this is the most amount of information I’ve ever seen on any food packaging. All of these details help you understand where your meat comes from, that the animal was humanly raised, and lived a good life prior to making it to your plate. These are details that many “big” factory farms don’t want you to know for obvious reasons. As mentioned above, all of the meat is kept frozen during transportation, thanks to an insulated box, dry ice, and a reusable cooler. You shouldn’t have to worry about anything spoiling, especially because your meat won’t take too long to find its way to your home. That means everything is going to be fresh and safe for you to enjoy, after you cook it, of course! Because each piece of meat is grass-fed, hormone-free, pasture-raised, and non-GMO, you’re getting a better quality. You’ll know exactly where your meat is coming from and what it’s been eating. This allows you to fully trust in Grass Roots and the freshness of the food they provide to you. And that’s more than can be said about meat from your local supermarket. If you are ever unsatisfied with something in your box, give Grass Roots a call. They guarantee you’ll be pleased with your order, but if you’re not, they can issue you a store credit or reship the product within 30 days of your purchase. They’re obviously willing to work with you, which should make you feel even more confident when ordering from them. We had zero issues with our box. Grass Roots is not like a typical meal delivery service that sends you ingredients and a recipe each week. You are totally on your own when it comes to preparing your meats. However, that doesn’t mean you should feel intimidated by it if you’re a new cook. You can find plenty of different ways to cook meats online. Because their meats are such high-quality, there’s no denying that you’re going to get incredible flavor with everything you order. Every single meat cut we ordered and cooked was delicious. We even purposely ordered the “Beef Bone Broth Basics” because it’s not something we’ve had more than once or twice. It turned out to be one of our favorites. If you’re thinking, “Why would I pay more money for meat I can get for cheap at the grocery store?” this is not the same meat. It’s not even in the same league. You can literally taste the difference. The meat is juicier, more flavorful, and more tender. The pricing for the meats you order is very reasonable, especially when you consider the quality you’re getting. One of the great things about Grass Roots is that they are 100% transparent with their pricing model. Their website states they take their direct input costs and add 25% and then tack on an additional $3.00 for shipping. There are no hidden chargers or over-inflated margins when ordering with them. Again, this is something that you never see with other companies. We found this to be another huge benefit. Their goal is simply to ensure the farmers they work with receive a living wage. There’s actually a full breakdown of what’s included in the costs that Grass Roots incurs. For example, with beef, they handle payment to the farmers, transportation, and processing. With chickens and turkeys, they need payment for feed, payment to the farmers, transportation, and processing. And for pork, they need payment for feed, payment to the farmers, transportation, and processing. 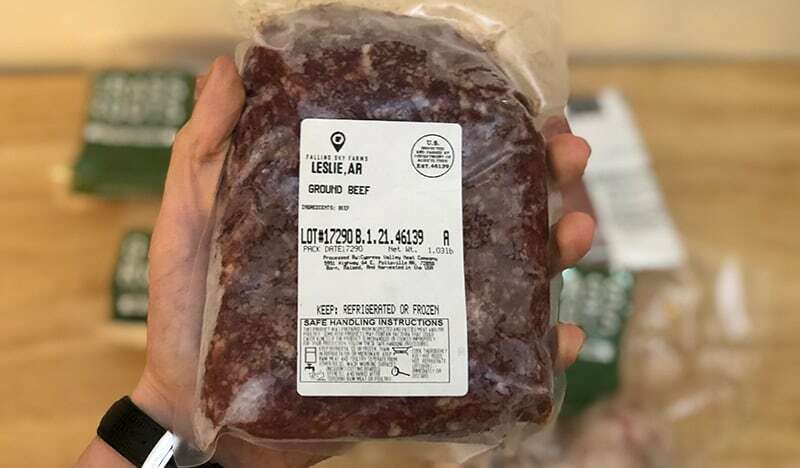 To give you an idea of what you can expect, here are a few examples from their current pricing: one pound of ground beef costs $8.66, one pound of bacon costs $12.06, a whole chicken costs $17.25, 12-14-ounce chicken breasts cost $12.82, and center-cut pork chops cost $19.44. Don’t want to build your own box? They offer a bunch of pre-made boxes. To help you decide, we made comparison table below. There are two things I absolutely love about Grass Roots. First, the amount of information that they give you with every single cut of meat is incredible. I don’t even know how they’re able to keep track of things like how much the animal ate but somehow they are. While including this information might seem like a novelty or gimmick, it really is much more. Understanding where your meat comes from and how it was raised gives you a connection with your food. You can be assured that it’s meat from an animal that actually lived a good life on a farm, rather than one that lived its life packed together with others in filth (like they do on some big farms). Second, the way that they structure their pricing is one of the most fair and transparent I’ve ever seen. They literally tell you exactly how much money they make working with each farm. This level of honestly and transparency is critical for building a long-term relationship with customers because it’s all about trust. 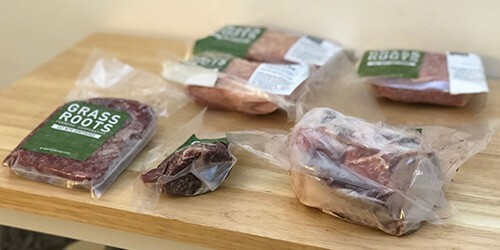 If you’re someone who is conscious about where your meat comes from, Grass Roots is the perfect “meat of the month” subscription box for you. With the ability to customize your box each month, you can always get exactly what you want in your order (no surprises). Special Disclaimer: Grass Roots gave us our first box free to try the service and give our honest feedback. We did not receive any compensation for this post.